“Practice Makes a Man Perfect”, I am sure everyone is agreed with this fact. There is nothing in this world which is impossible, right? Well, same in the case of Basketball, with a continuous practice you can improve your gaming skill. But, first you have to improve your ball handling ability and this is only possible with practice. Keeping these things in mind “Larry Hughes” the well-renowned basketball player is here with the Youth Basketball Drills Program. His main mission is to improve the basketball skills and enhance the leadership quality. Basketball is an enormous sport to play and mainly considered it as youth sports. They show great interest in the basketball court that is why; they can easily learn how to control the basketball and get success. 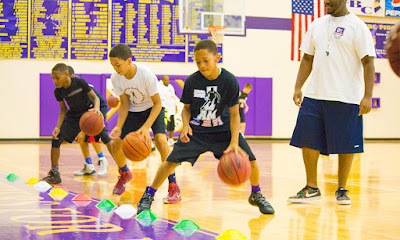 There are many youth basketball players who can dribble the basketball very well, but struggle to control it in tight situations. The main reason behind this lack of interest, although there are plenty of reasons as to why someone may struggle with handling the basketball with control. To dwindle this problem Larry Hughes Academy provides the highly professional private basketball coaches in Missouri. These coaches provide skill training, basketball education, and leadership opportunities for all children. Larry Hughes generally focuses that each of his players in St. Louis academy must have good command to handle a basketball. According to him, when you can handle the basketball with efficiency, there are a number of changes to reduce your amount of mistakes, turnovers, missed opportunities, and the period of time you will take for your next move and you will be able to create your own shot off the dribble that will give you an opportunity to shoot a decent shot whenever you want. Here at St Louis Academy, Larry Hughes trained the youth basketball teams St Louis for every tournament. Generally, most of the youth players focus on shooting the basketball from long range or learning how to dunk. Now, these are two crucial aspects: that you should work on, while learning the game, but being able to handle the basketball will make doing other two much easier. Larry Hughes teaches their youth players about the importance to handle the basketball in every training session. There are two other crucial aspects that Larry Hughes highlighted in every training session when he trained their Youth Basketball Teams at the St Louis Basketball Academy. Focus: More important than passing the basketball is to deliver it. Every player and coach had witnessed turnovers occur due to bad passing. Only to release the basketball in the direction of a teammate is not enough to be successful unless it arrives in the hands of a teammate. For this reason, Larry Hughes wants their players must demonstrate focus to deliver the ball to its target and practice passing with this mental attitude. Positioning: Often at offense, the player stands still and avoids moving with the progress of the ball. Larry Hughes explains to his youth basketball players "If you want to see, join me on the bench. But, if you really want to play, don’t stand ideal; remain in constant movement with the ball." Sometimes player abandon the person who has the ball, making it more difficult for him/her to pass the ball. So, if you also want to take your training from the St. Louis academy one thing must remember, do not stand still, keep moving and always be prepared for the catch. Larry Hughes Basketball Academy attains a simple phenomenon “United we Grind, United We Shine”. So be united and play for your team to get the maximum goal.